Thank Zues! 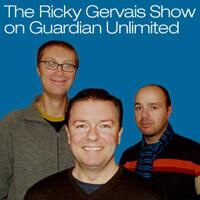 Steve Merchant, Ricky and their producer Karl Pilkinton (who is perhaps the most twisted mind of the troica) have a podcast through Guardian Unlimited. The finest element is the spiraling delivery of "monkey news", featuring unconfirmable recounts of philanderous simians, a tolerant zookeeper (and his wife), and rampaging chimps. When my wife and I became new parents, one of the best gifts we were given was the first season of The Office, brain-child of and vehicle for the man himself, Ricky Gervais. With only 2 seasons and one bonus Christmas show, the ride was over too quick. Now there is the American version of the office which is... eh... OK, I guess. Plus the HBO series, Extras. But nothing close to the mania and mayhem of the BBC original.